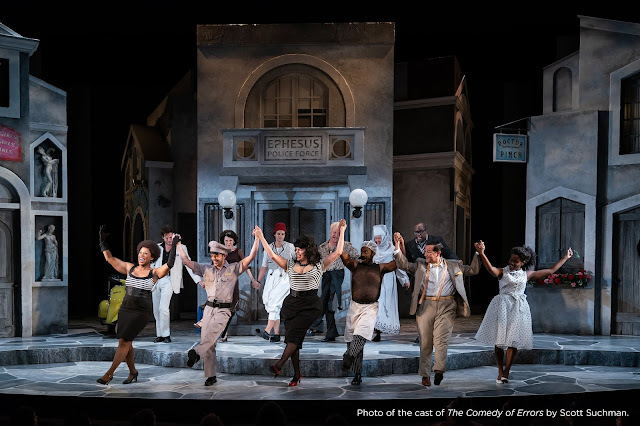 In Ron Daniels' production of Othello at the Shakespeare Theatre Company, audiences are greeted first by Ricardo Hernandez's stark set design. Eschewing the proscenium for the paneled walls of the Harman stage, Hernandez gives us a raked platform, industrial fans, and oil barrels on stage right and left. The sound design by Fitz Patton in similarly spare; instead of the overuse of underscoring so prevalent in many productions today, only rarely does Patton sneak into the scene, enhancing a moment with gradually swelling drums or music. Emily Rebholz's costumes largely keep to high and low military uniforms, or simple dresses of the period (the continuing conflicts after WWI). Daniels' intention seems to be to steer clear of the trappings, and let Shakespeare's play stand on its own, with this company, in this space. Unfortunately, the production rarely breaks free of the mundane. Rather than leaving the stage bare that is filled by the emotions and the performances, the stage often feels as though it dwarfs the actors. Daniels' desire to create a world in which the inevitable tragedy feels justified by a recognizable world of psychological realism engenders a stage of scaled-down performances that rarely excite. I found myself searching, increasingly desperate as Act I trudged onward, for the passion that supposedly drives Shakespeare's characters in this play. Faran Tahir as Othello, Jonna Roberts as Iago, and Ryman Sneed as Desdemona give performances that are thoughtful, careful, and seem inconsistently motivated by the passions they claim aloud, too interior to fill the empty space of the Harman. The pacing of the first half in particular seems to drag, which also saps energy out of the events that need to be building to an unbearable tension. There are some moments that nevertheless managed to grab my attention, even in the overlong Act I. Patrick Vaill's Cassio, spurred by Iago into drunkenness and a fight that loses him his coveted position serving under Othello, brings a dynamism and humor to the stage that lifts the scene up and gives Roberts's Iago a wonderful foil to play against. I also appreciated a shift in Rebholz's costume design for Othello in Act II, taking him out of his military uniform and into robes that belied his seeming assimilation into the Venetian military culture. These kind of design choices are a wonderful opportunity to question assumptions about the character and the play, opening a window into the play that might otherwise remain unexplored and unopened, and it was interesting to see these shifts coming late in the play through costume design. Theatre Company's Othello, directed by Ron Daniels. Photo by Scott Suchman. Ultimately, I cannot recommend this production. To my eyes, Act I was a slog and Act II left me cold. As I watched the play, I began noting elements Daniels had set up that should have created a production I enjoyed. Shakespeare without extraneous trappings is often the most visceral and can cut right to the heart of the text; I was also pleased to see that actors were often directed to address the audience directly, something so basic to Shakespeare's stage that is all too often forgotten. Somehow, the elements were all there, but the production never came together in a way that excited me, and Othello is a tragedy that should, if nothing else, rouse its audience.